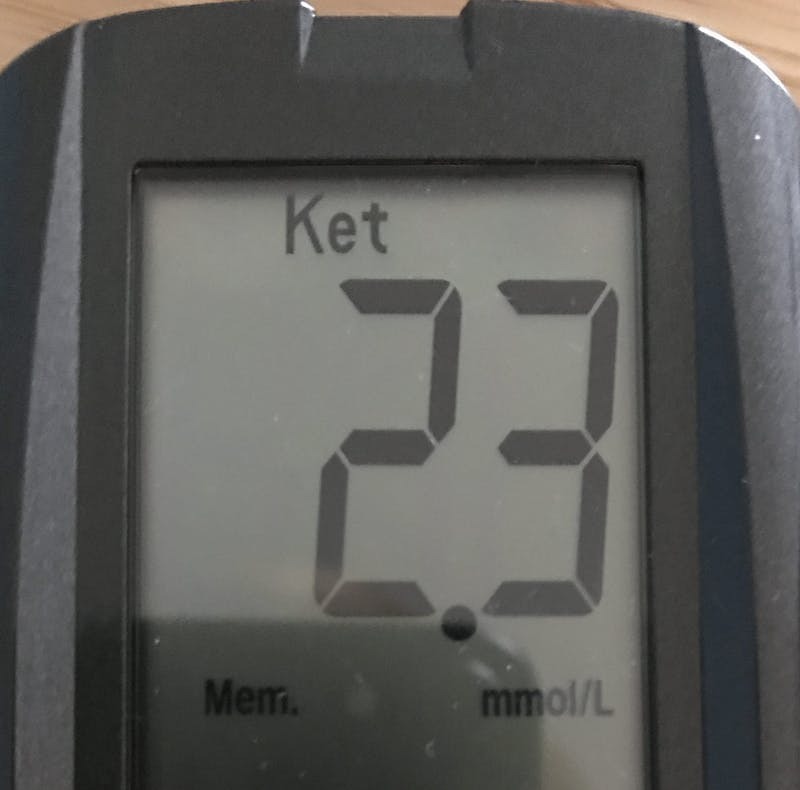 Having been a low-carb enthusiast and team Diet Doctor member for years, you would have thought I’d nailed ketosis ages ago. I haven’t. In the last post, Why You’re Not in Ketosis, I revealed why, and how I fixed it (by reducing my carb and protein intake to 20 and 60 grams per day respectively). But, I had a problem. Though it felt awesome to be back in ketosis, it sucked to eat so little protein – 60 grams a day isn’t much for a meat lover like me. Could I eat more protein AND remain in optimal ketosis? What would be my daily-protein limit? First, I would increase my protein intake from 60 grams a day to the level where I would no longer be in optimal ketosis. Then, I would reduce my protein intake until I was back in optimal ketosis, using what I ate on the last day to define my daily-protein limit. Finally, I’d eat to this daily-protein limit every day for a week to test its accuracy, adjusting my protein intake if necessary. To start off the experiment, I measured my blood-ketone levels: 2.0 mmol/L. Not exactly shocking news – I had been eating 45-60 grams of protein and 10-20 grams of carbs a day for weeks, being in optimal ketosis almost every morning. But all that could end soon – it was protein time. On the first day of the experiment, I ate similarly to how I’d eaten lately – butter, eggs, ground beef, and some vegetables, but no berries or nuts. For the extra protein, I ate the totally delicious taco-cheese shells. Awesome. The totals for the day were 85 grams of protein (40 grams more than the day before), 10 grams of carbs (10 grams less than the day before), and lots of fat. Would I be out of optimal ketosis by tomorrow morning? I woke up at 06:10 am. Feeling a little nervous, I walked quickly to the living room, sat down by the dinner table, and prepared my blood-ketone meter. “Not again”, I thought as the needle closed in on my finger. Oh yeah, optimal ketosis and 0.4 mmol/L more ketones than yesterday! Good news, but it was early days. What caused the ketone increase? Perhaps it was eating 10 grams carbs less than the day before, perhaps it was random variance (the blood-ketone meter isn’t 100% accurate), or perhaps it was something else. I couldn’t be sure. I upped my protein and carb intake a notch by eating a few more vegetables and raspberries, and by replacing those crispy taco-cheese shells with a few slices of the legendary low-carb pizza. So delicious! The totals for the day were 100 grams of protein (+15 grams), 20 grams of carbs (+10 grams), and lots of fat. Could my ketone levels survive this carb and protein onslaught? Day 3: Liver, eggs, cheese, and more pizza! I woke up early, walked quickly to the living room, sat down by the dinner table, and prepared my blood-ketone meter. “Ouch, not again”, I thought as the needle was about to attack my finger. I touched the ketone strip and waited. Oh yeah, optimal ketosis! 0.4 mmol/L less ketones than yesterday, but the same ketone levels as on day 1 having eaten 40 grams more protein. And I had doubled my carb intake from the day before. What caused the ketone reduction? Perhaps it was eating more protein and/or carbs, perhaps it was random variance, or perhaps it was something else. I didn’t know. I decided to go for it. How much protein could I possibly eat in a day while keeping carbs to maximum 20 grams? I stuffed myself with liver, eggs, cheese, and more low-carb pizza. Eating so much felt great, but after a while I was totally stuffed. I went to bed feeling nauseous – too much food. The totals for the day were 135 grams of protein (+35 grams), 20 grams of carbs (+0 grams), and lots of fat. Day 4: Bye, bye ketosis, right? I woke up super thirsty. After chucking down a big glass of water, I walked to the living room, sat down by the dinner table, and prepared my blood-ketone meter. “Here we go again…”, I thought as the needle charged down on my finger. I touched the ketone strip, and waited. After eating as much protein as I could stomach, my ketones went up by 0.3 mmol/L from the day before. Not what I expected. Could my daily-protein limit be higher than the amount of protein I wanted to eat? Or perhaps my body was in need of extra protein after a weeks of eating too little? To find out I decided to change the experiment. Instead of forcing myself to eat more and more protein, I would eat all the protein I wanted to for a week, and see whether that would kick me out of optimal ketosis. If so, I would reduce my protein intake until I was back in. So, every day for a week, I ate in the 80-130 grams of protein, and 10-20 grams of carbs, range – plus lots of fat of course. What happened to my blood-ketone levels? They stayed around 2,0 mmol/L every morning – optimal ketosis. I’m still eating as much protein as I want, but I’m super strict with my carb intake – I keep it to maximum 20 grams a day almost every day. To make sure I don’t drop out of ketosis without knowing, I measure my blood-ketone levels once a week. 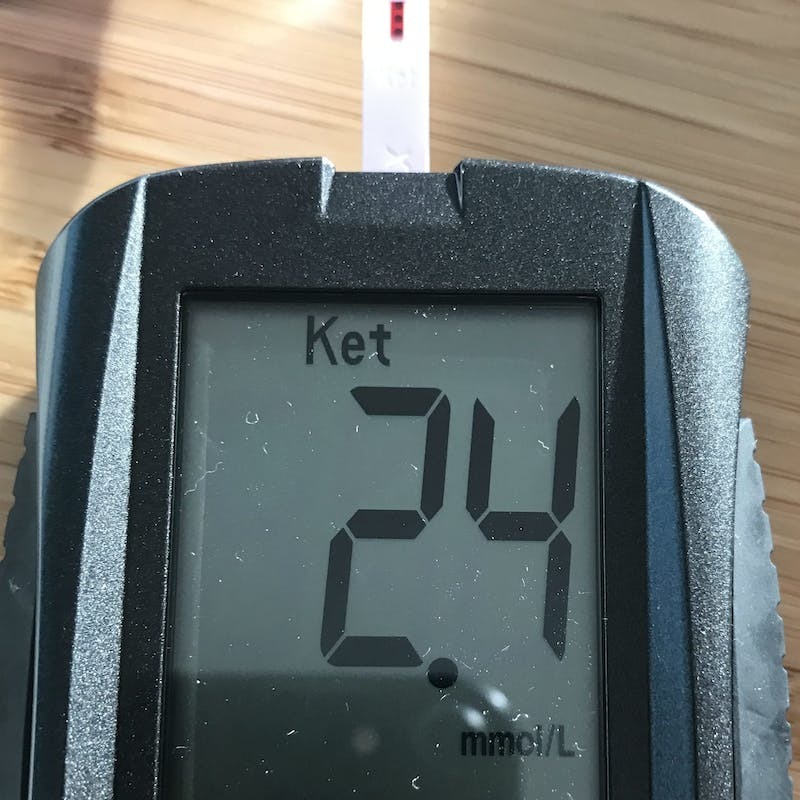 So far there’s been only one surprise – 0.5 mmol/L ketones the morning after I ate at a Lebanese restaurant near the Diet Doctor main office – probably some added sugar. Dining out can be hard. The most important thing for optimal ketosis is to eat maximum 20 grams of carbs a day. A while back I found out I’d been lying to myself for years – I wasn’t really in ketosis. To understand why, I did an experiment and learned that I’d been eating too many carbs and possibly too much protein. 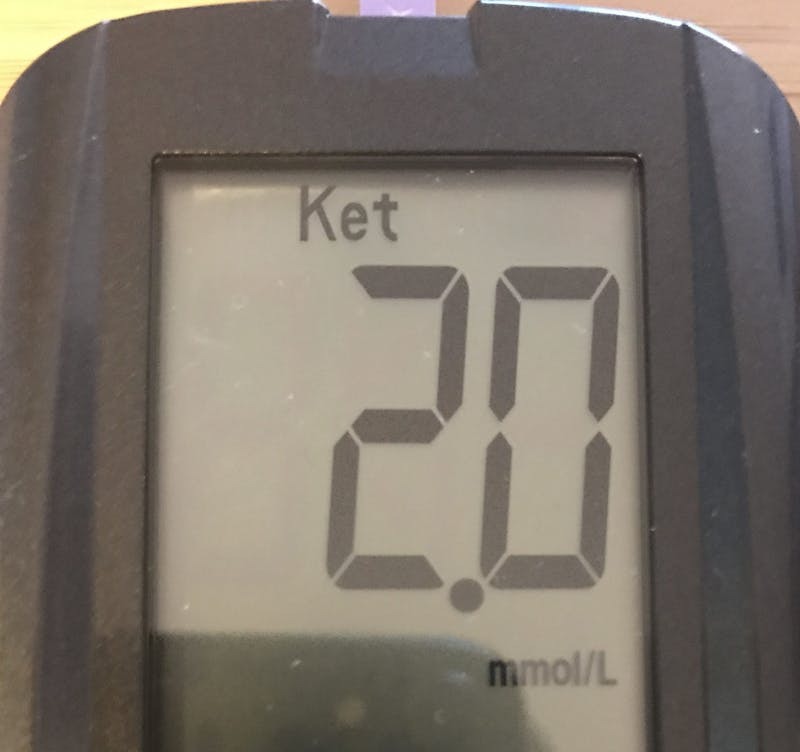 I immediately reduced my carb and protein intake to maximum 20 and 60 grams per day respectively, and boom – straight back into optimal ketosis. But I didn’t love eating just 60 grams of protein. To find out how much more I could eat AND remain in optimal ketosis, I did the above protein experiment. From this latest experiment, I’ve learned that I can likely eat 80-130 grams of protein a day for weeks, and possibly for way longer, without dropping out of optimal ketosis. So, for me, the key to optimal ketosis is to restrict the intake of carbs to less than 20 grams of carbs a day. First note that far from everyone has to stay in optimal ketosis (1.5 – 3 mmol/L). Lots of people do fine on low carb without it. But staying close to that ketosis range may improve mental and physical performance, it often results in more weight loss and it can have certain other potential health benefits, like controlling epilepsy or migraine. Restrict protein to moderate levels. If possible stay at or below 1 gram of protein per day, per kg of body weight (0.45 grams per pound). So about 70 grams of protein per day if you weigh 70 kilos (154 pounds). It might be beneficial to lower protein intake even more, especially when overweight, and then aim for 1 gram of protein per kg of desired weight. The most common mistake that stops people from reaching optimal ketosis is too much protein. How much protein can you eat? But as this post indicates, I can eat significantly more protein and remain in optimal ketosis. Can you? If you, like me, are a 36-year old insulin-sensitive male, who weigh 152 pounds, exercise for 10-15 minutes five times a week, and have no history of obesity or diabetes, then possibly yes. However, if you’re overweight and/or have high blood-sugar levels, then possibly no. The more you exercise, the more protein your body needs – walking, running, and resistance training are all good options. When you exercise more, you can increase your protein intake somewhat too. To make sure you don’t go overboard with protein, measure your blood-ketone levels frequently and adjust your protein intake accordingly. Remember to keep your carb intake to maximum 20 grams a day. Perhaps your daily-protein limit for staying in optimal ketosis is different from what Diet Doctor generally recommends? 1. Buy a blood-ketone meter with test strips (Diet Doctor does not make any money from you buying this). 2. Eat less than 20 grams of carbs a day for a week. Then, test your ketones first thing in the morning before eating anything. 3a. If your blood-ketone levels are at 1,5 mmol/L or above, increase your protein intake gradually over the next week. Measure your blood-ketone levels every morning and see what happens. Keep measuring your ketones for a few days, and if you’re always in optimal ketosis, measure just once a week. If you drop out of optimal ketosis, make sure you’re eating maximum 20 grams of carbs a day. If you already are, but your ketone levels are not in the optimal range, reduce your protein intake a little. 3b. If your blood-ketone levels are below 1.5 mmol/L, reduce your protein intake gradually over the next week. Measure your blood-ketone levels every morning and see what happens. How much do you have to reduce your protein intake before your ketone levels rise above 1.5 mmol/L? Eat a little less protein than that *. * We don’t recommend that you eat less than 0.4 grams of protein per pound of desired weight for long periods of time. You need protein. 1. What would happen if I ate more than 135 grams of protein a day? I assume my blood-ketone levels would start dropping at the point when my body no longer needs all the protein it’s getting. At that point, it would likely convert the extra protein to glucose which would raise blood sugar and reduce blood-ketone levels. I won’t test this anytime soon though as I don’t want to eat more protein than I’m doing now. 2. What would happen if I ate 80-135 grams of protein a day for months or years? I think doing so would keep me in optimal ketosis – that’s what the findings from this experiment indicate – but I won’t know the answer to this question for a while yet. I’ll keep measuring my ketones weekly and will give you an update later this year. 3. What would happen if I exercised less? I assume doing so could reduce my blood-ketone levels a little as my body would need less protein, but at what point that would happen I’m not sure. Haha, I love how much misinformation is provided in this post. Do your research people. Not on blogs like DietDoctor, but actually look up studies. You'll find out that the only thing that triggers ketosis is the restriction of carbohydrates. The amounts of fat or protein you eat do not matter. Obviously you don't want to eat three times your body weight in grams of protein, but really: who does that? Just make sure you provide your body no more than 20 to 50 grams of carbohydrates per day (it varies, some can go 30, some have to stay below 20, etc.) and you'll be in ketosis after a couple days. Stop overcomplicating the ketogenic diet. It's not that hard. I'm average I consume 200+ grams of protein a day and been in keto for ages. Also I ran a little experiment to get to the bottom of this nonsense and fear of protein. Higher than normal protein consumption. 100-150 grams of whey PER MEAL and up to 500gms of protein per DAY.... Did blood ketone tests over 50 times. Zero issues on my blood ketone levels and even blood glucose. I wish more people would do this because GNG is like the Loch Ness monster of the keto world. So unless someone experiments like this they need to stop spreading decades old myths. Congrats for starting Keto! You're on the way to feeling great and reversing your diabetes! When you first start out, the most important thing is to be kind to yourself. Try (as hard as you can) to make things as uncomplicated as possible. Resist the urge to count anything except net carbs (i.e., grams of carbs minus grams of fiber equals net carbs). Just focus on all the delicious things that you like to eat that are low-carb and avoid all the sugar and processed food and starches. That said, there's a wide, WIDE variety of opinion on the "how much protein should I eat" topic. Depending on who you ask, it's anywhere from 0.8 to 1.8 grams per kilo of body weight (for women....there's different recommendations for men). Some folks further specify "per kilo of 'ideal' body weight." I think part of why there's such a wide variety of opinions on the "right" amount is because every single one of us is unique, and each and every single one of us should be able (through a little trial and error) to find the amount that makes us feel our best. So, you will probably have to experiment a little to find the magic number for you. You should be feeling completely satisfied after a meal, and not hungry for at least 4 or more hours. Your calculations would be: for 175lbs (79 kilos), somewhere between 63g and 142g. If you calculate with the ideal weight of 130lbs (60kilos), then it's somewhere between 47g and 106g. How to figure out what's right for you? DO NOT STARVE YOURSELF. Eat until you are satisfied, stop when you're full. If you really want to track the macros, use an app, but instead of aiming for a specific number, just use it as a log of what you ate. As long as you are feeling good and not hungry, you'll be able to see the trend week by week for the amount of protein that "felt right" for you. Some days I'm more active, so I eat a little more because I feel the need to really nourish my body. Other days, I'm just not that hungry so I don't feel the need to eat as much. But over the course of a week, there's a fairly narrow "range" that feels good, and I just naturally fall into it. If, after reading this, you still NEED an exact number, I'd say start with 100g and adjust from there. If that feels like too much, then lower it. If you're hungry, bump it up a bit. Gayle, there is no simple answer, just a simple partial answer. I'm still looking for an answer to protein, but the answer to the carbs is simple -- no simple carbohydrates. That means no sugar, and no starches, such as rice, flour, or potato. I wish “lots of fat” was more specific. How many grams of fat? All 3 macronutrients matter. It’s not just “low carbs”. Most of my patients find that too much protein reduces ketosis. I use the equation discovered in the 1920’s and used by the Charlie Foundation. Fat vs. protein plus carbs in grams. Achieve a 2:1 ratio for heavy nutritional ketosis. use the equation discovered in the 1920’s and used by the Charlie Foundation. Fat vs. protein plus carbs in grams. Achieve a 2:1 ratio for heavy nutritional ketosis. Thank you. I’m so tired of hearing that too much protein will kick you out of ketosis. The body doesn’t work like that. Just starting this keto diet. After reading all this, I can see no two people agree on anything. Firstly you will find that when you start your Keto way of life, not diet, you will have higher levels of ketones initially, then they tend to go to the lower end of the mml scale. Also you tend to lose weight quicker at the beginning of your new lifestyle, this appears to be water weight, and as suggested, it then tends to settle down, then you are able to better adapt different portions up or down. I myself am a super high responder to cholesterol, my cardiologists is going nuts but my overall ratios are better. He won’t listen, we did a deal, my current cholesterol overall is 320 quite high to my cardiologist, the deal is if in 6months I haven’t had a stroke or heart attack, he will begin to listen to the benefits of Keto and stop quoting me American Heart Association parameters trying to sell drugs. You may need to reevaluate or make sure you are calculating correctly. 80g ham is only 15-20g protein. I don't understand how you are calculating the protein grams. I always thought 1g of meat = 1g protein. Ha Laurie. I would like to hear how that deal pans out. Disappointing to hear just how far behind the times your cardiologist is if he doesn’t even look at ratios or triglycerides. You could get him off your case if you had a Coronary Calcium score of say “0” like Dr Gerber or Jimmy Moore. I usually estimate that 1gr of protein = 4gr of lean raw meat (according to several sources on the internet). One large egg has about 7 gr proteins. Hey just reading ur comment, ive been taking in anywhere from 130-200 grams of protein a day but i keep my carbs strictly at 20. Im pretty physical active also, do you think im fine? Your experiment was to see if you get kicked out of Ketosis with eating lots of protein once a day. The problem is you measured your Ketone levels after you fasted all night. You might of been out of Ketosis after you ate all that protein but then after fasting for 10-12 hours you got right back in it. How many grams of fat allied per day ? And do we count saturated fats, trans fats or both ? I somewhat experienced your ketone experiment. I feel that it’s the carbs that’s the culprit in messing up the ketones more than proteins. Also the literary way of your writing... I enjoyed reading it. Thank you for sharing. In regards to "too much protein" my question is, what happens when someone eats too much protein, low carb, but also low fat, meaning lean protein? I am no scientist, but I would venture to guess that GNG occurs when protein is the outstanding macronutrient in your body and it is significantly higher than the others. If someone ate only chicken, turkey, fish, etc with less fat, would they then enter GNG? If ur fat & protein macro levels are similar but still high, I think Ketosis would still occur. I of course could be wrong, but it's worth finding out. Or you can use an app like Lose it! To calculate your macros from every item / meal you eat. How long does it take to get into Ketosis? I have been following Keto diet for three weeks. My macros are 20 carbs, 79 protein d 101 fat. I track religiously. I never eat 20 carbs, usually 10 or 12. I seldom eat my max of protein, more like 65-70 and I usually eat 90 - 100 fat. I have been dedicated about this, have never cheated, drink lots of water and yet, no Ketosis. I am tired despite getting seven to eight hours sleep. I lost five pounds in the first three days then it’s been .1 every couple of days if I am lucky. Suggestions? Claudia, I had the same problem and it was something so easy that I had too much stress and frustration in my day to day life. It stops me to get in ketosis, I was trying 4 months!!!! Now back home in my better life(I was abroad) ketosis kick in very easy, Stay put check if you are not eating something that you shouldn't...I react bad with broccoli, butter help me get in, not coconut oil(for me is better after , but not before ketosis). Keep it simple don't over complicated and you will get in, try relax about the whole issue. Greets! Now I have a question, I go in a bikepacking tour, 80-100 kms per day, riding 20 days, I'm already in ketosis. I have whey protein that per portion comes to 1 gr carbs. I was thinking take 1 shake during the ride per day, but I'm concerned it with kick me out of ketosis, is a convenient way to have something during the ride, weights almost nothing, but if kick me out...then better take my tuna fish dose. What you can tell me? Thanks to all. GNG is gluconeogenesis, the process by which body makes glucose from protein. I don't understand NET carbs. I understand HOW they are calculated, but let's say someone is trying to stay under 20 NET carbs. So would be fine for them to have 300 carbs today as long as the foods contained 280 fiber? That just doesn't make sense to me. I thought the idea was to be below 20 total carbs. Seems like NET carbs could end up with a lot of carbs.